You can now track your Facebook Video level metrics like reach & engagement, video retention metrics, auto-play vs click-to-play stats, segment the data by fans vs non-fans, etc. You can measure video views, unique video views, understand which parts of your video are most engaging & least engaging to your audience, understand your audiences appetite for video length, look at engagement stats viz likes, comments, shares, re-shares & negative feedback. Further, you can segment the data across Locations, Device Types, Traffic Sources and Countries among others. You can also track your Facebook Ad & Video Monetization Stats like Earnings, Impressions & CPM, all on a single dashboard along with your YouTube stats, monetization stats and analytics data. This metric tells you how many people your video reached and how many of those who were “reached” actually viewed the video. A video view is often defined by watching the video for at least three seconds (though Facebook’s newer average watch time replaces that metric). Start by comparing how videos posted natively to Facebook compare with YouTube videos shared on Facebook. You want to see if you get a performance boost by posting natively to Facebook, and if so, how much. 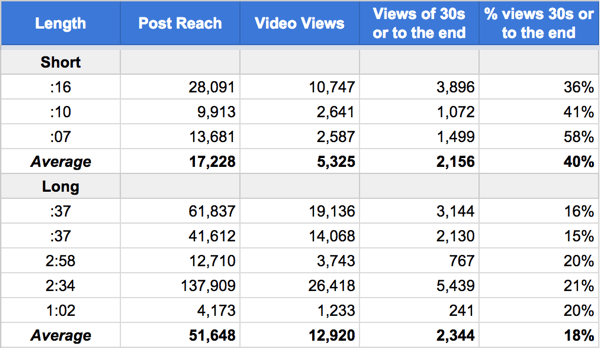 From the above example data, you can conclude that sharing a YouTube video rather than uploading native video to Facebook would cost the organization some engagement and reach. To see if your business should upload videos natively to Facebook instead of YouTube to maximize their performance, compare your own numbers. Social media is often considered tailored to those with short attention spans, so how would you expect videos with short and long play times to compare? Of these eight videos, five are longer than 30 seconds, and three are shorter. In the chart above, they’re broken down into two groups: Short and Long. The sample size is a bit small, so the individual data is also included so you can get a sense of the variance. First, look at the reach and impressions to see if your audience favors the longer video content or the shorter. Again, Facebook may consider longer video content to be more rare, and thus those videos get more impressions and reach to create more content balance and variety. If you want to get more reach and impressions, Facebook seems to provide that to longer videos. Next, find out how much of the videos people watch. The data says even for short videos (under 20 seconds), only 40% of viewers made it all the way to end. For the longer videos, it’s only 18%. So if you’re posting videos and you have an important call to action, make sure you include it at the beginning of the video or cover the offer in the surrounding text. Then, look at engagement. Again, the longer videos have considerably higher average engagement levels. Keep in mind that the longer videos also received higher levels of impressions and reach. The good news is that if you want to maximize your reach and impressions (something that has been declining for organic content), Facebook seems to reward longer video content with more impressions and reach. Again, different types of video content generate different levels of activity up and down the spectrum of metrics. If you pay attention to these metrics, you should be able to get more impact where you want it. You can track all of this and more on Tercept. As always, everything on Tercept is fully automated, real-time and built to suit your specific requirements. So that you spend less time juggling logins/preparing reports and spend more time generating insights, closing deals & serving your customers.